This education complaint letter respectfully addresses a principal on the subject of an errant teacher. Firstly, I would like to thank you for doing such an excellent job as principal at Jefferson Elementary. I know that the position and responsibilities are difficult, but I hope that you might be willing to help me reconcile an issue I'm having in the classroom. 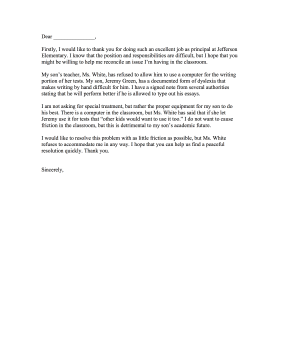 My son's teacher, Ms. White, has refused to allow him to use a computer for the writing portion of her tests. My son, Jeremy Green, has a documented form of dyslexia that makes writing by hand difficult for him. I have a signed note from several authorities stating that he will perform better if he is allowed to type out his essays. I am not asking for special treatment, but rather the proper equipment for my son to do his best. There is a computer in the classroom, but Ms. White has said that if she let Jeremy use it for tests that "other kids would want to use it too." I do not want to cause friction in the classroom, but this is detrimental to my son's academic future. I would like to resolve this problem with as little friction as possible, but Ms. White refuses to accommodate me in any way. I hope that you can help us find a peaceful resolution quickly. Thank you.